NOTE: Before purchasing, check with your instructor to ensure you select the correct ISBN. Several versions of MyLab™ and Mastering™ platforms exist for each title, and registrations are not transferable. To register for and use MyLab or Mastering platforms, you may also need a Course ID, which your instructor will provide. If purchasing or renting from companies other than Pearson, the access codes for MyLab or Mastering platforms may not be included, may be incorrect, or may be previously redeemed. Check with the seller before completing your purchase. 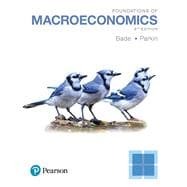 Foundations of Macroeconomics , 8th Edition introduces readers to the economic principles they can use to navigate the financial decisions of their futures. Each chapter concentrates on a manageable number of ideas, usually 3 to 4, with each reinforced several times throughout the text. This patient approach helps guide individuals through unfamiliar terrain and focus them on the most important concepts.